The most decorative editions of Johnson's Maryland-Delaware series. 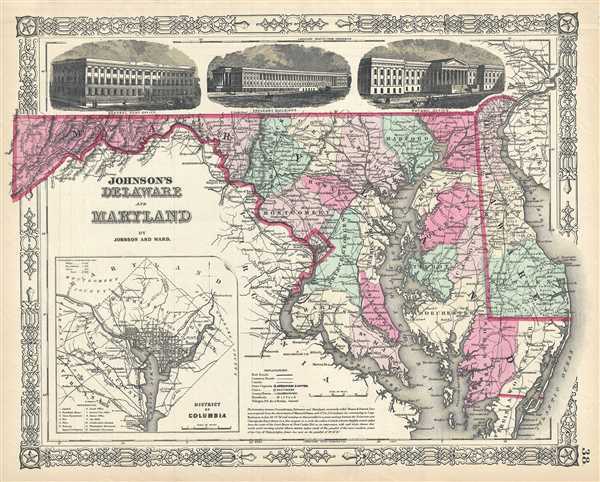 This is a fine Johnson and Ward map of Maryland and Delaware dating to 1866. It covers both states as well as the capital district in considerable detail. This is the most decorative of Johnson’s Maryland-Delaware series with engraved views along the top of the map detailing the General Post Office, the Treasury Building and the Patent Office. Most earlier and later editions of this map remove these decorative elements. An inset map of the District of Columbia is also included in the bottom left quadrant. At the bottom of the map, in the center, a text block describes the work of Mason & Dixon in drawing the Pennsylvania - Maryland border along the 38th latitude. Features the fretwork style border common to Johnson's atlas work from 1863 to 1869. Published by Johnson and Ward as plate no. 38 in the scarce 1866 edition of Johnson's Family Atlas. Very good. Minor spotting and toning. Some edge wear with verso repair.